Welcome to our website. 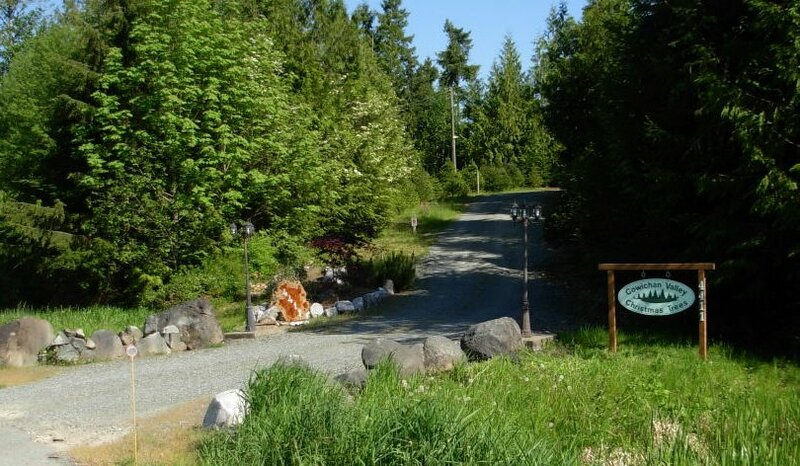 Our Christmas Tree Farm is located on 5 acres in the Sahtlam area of Duncan in the Cowichan Valley. For the last eight years, our farm has been growing a variety of local, Cowichan Valley Christmas Tree species including Douglas Fir, Noble Fir and Grand Fir for the festive season and we invite you to come on out and choose your Christmas Tree while it is still growing. Our Christmas Trees will only be cut once you are satisfied with your selection to provide you with the freshest local tree available. So why not plan a little trip? Bring your family and enjoy your search for the "perfect" tree. We are Open until Dusk from the beginning of November until Christmas Eve. Saws are provided if you wish to cut your own tree or we will do it for you. Coffee and Hot Chocolate are provided free of charge. $5 from every tree cut will be donated towards PAC programs in our local Elementary schools. We are located off Riverbottom Road. Travel West on Cowichan Lake Road, past Sahtlam Fire Hall. Turn left onto Riverbottom Road and an immediate left onto Webdon Road - we're on the right hand side of the road a few hundred yards down. (Follow posted signs).